Gastrointestinal (GI) stasis is the term for lack of movement through the digestive or gastrointestinal tract of a rabbit. This disease is often difficult to recognize and treat. It can commonly occur in rabbits that are stressed or have sudden changes to their environment or diet. If not recognized, rabbits may quickly enter into a downward spiral and may die if untreated. Gastrointestinal stasis occurs when movement in the digestive system slows down. It decreases the appetite of the animal and lowers food and water consumption. This causes the animal to become dehydrated, and water is pulled from the gastrointestinal tract of the rabbit leading to potential impaction, bloating, and gas. If left untreated and the rabbit remains off food for too long, GI stasis can lead to fatty liver disease and death in rabbits. Increasing the fiber consumption of your rabbit by offering fresh hay or high-fiber vegetables. Decreasing the amount of pellets the rabbit is offered to encourage increased hay consumption. Trying to increase water consumption. Increasing exercise to help get the GI tract moving. Gently massaging the abdomen of your rabbit. If the symptoms continue to persist or appear to worsen, you should take your rabbit to a veterinarian who specializes in rabbits right away. The sooner supportive therapy can be started, even if it is something as simple as oral or subcutaneous fluids and supplemental nutrition, the better. If your rabbit has a lack of stool production for 12 hours or more, take it to the vet immediately. The vet may palpate, listen to your rabbit’s abdomen, or take X-rays to check for a blockage in the gastrointestinal tract. 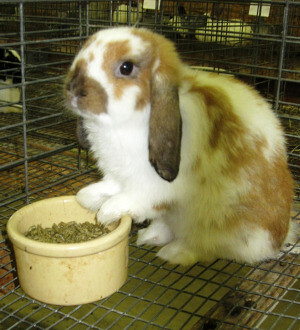 The vet will work to restore GI motility, restore proper hydration, and normalize the rabbit’s body temperature. Your vet may recommend that you syringe feed your rabbit a product like Oxbow Animal Health’s Critical Care for Herbivores to stimulate the gastrointestinal tract. While the specific reasons that rabbits get GI stasis are not completely known, a few things can be done to prevent the disease. Reduce stress in your animal by providing a clean, consistent environment. Provide adequate exercise for your rabbit. Feed your rabbit a high-quality diet which includes free access to a high-quality grass hay, limited amounts of a uniform high-fiber pellet, and limited amounts of fresh greens/veggies. It is important to watch for changes in the behavior or stool quality of your rabbit to catch the disease before it progresses.